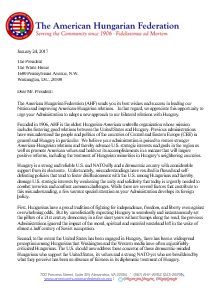 [Download] the AHF Letter to Wess Mitchell. 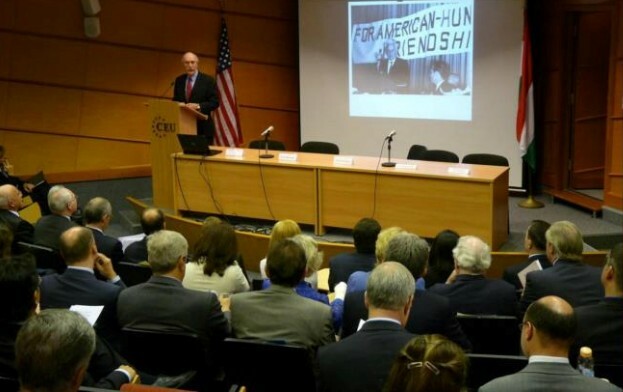 The American Hungarian Federation (AHF), founded 110 years ago, has long supported positive bilateral relations between the United States and Hungary as a means of advancing U.S. strategic interests in Central and Eastern Europe. We now write you to express our deep concern that these interests are in jeopardy, having been compromised by the Department of State’s policies under both Democrat and Republican administrations. These policies have culminated in a barrage of public criticism about Hungary even though that country is a strong and reliable U.S. and NATO ally with a proud history of resisting the tyranny of totalitarian communism. The negative impact of such public criticism was exacerbated on November 7, 2017, when the State Department’s Bureau of Democracy, Human Rights, and Labor (DRL) announced its intent to take active measures to intervene in Hungary's political environment. DRL did so by announcing a "funding opportunity" drawing on 700,000 U.S. tax dollars for the support of "objective media" in Hungary. This unparalleled and inexplicable act directed at a NATO ally and democratic country (classified as such by the Department itself) unnecessarily alienates and demeans Hungarians. While Hungary’s democracy may not be flawless, anyone familiar with the media landscape can see examples of unfettered criticism in the Hungarian media of government policies, including criticism of the prime minister himself. In fact, Reporters Without Borders ranks Hungary’s press freedoms above that of Japan and Israel, both allies of the United States, but we don’t see any intention by the Department to support “objective media” in those countries. Nonetheless, the State Department’s DRL is doing precisely what the Administration has warned against. As a result, there is a very real possibility of disturbing the important strategic relationship between the United States and Hungary. Winning over Hungarian public opinion, instead of alienating it by openly intervening in Hungary’s politics and media, is what is needed to not only preserve but strengthen this relationship and thereby advance U.S. strategic interests in the region. Starting this process would require the DRL to suspend its media project for Hungary and other similar ones that may be in the pipeline. We hope that you will consider our views, which reflect the very objectives the Administration has enunciated. We would appreciate your meeting with us to explore ways we can work together to achieve our mutual goals.